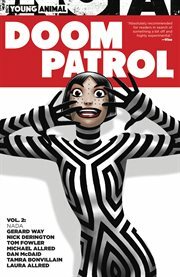 The item Doom patrol, Volume 2, issue 7-12, Nada, Gerard Way, Jeremy Lambert, writers ; Nick Derington, Tom Fowler, Michael Allred, Dan McDaid, artists ; Tamra Bonvillain, Laura Allred, colorists ; Todd Klein, letterer, (ebook) represents a specific, individual, material embodiment of a distinct intellectual or artistic creation found in Charlotte Mecklenburg Library. Who is Eddie Zilch, and what exactly is he selling? Of all the questions the Doom Patrol has faced in its long and hallucinogenic history, these may prove to be the weirdest yet. A mysterious consumer product that "makes everything better" is threatening to turn the comfortably odd existence of Robotman, Flex Mentallo, Crazy Jane, Negative Man and Casey Brinke inside out-along with the rest of the world! Not even the return of the Chief himself, Niles Caulder, can stop people from swallowing Zilch's pitch. But someone had better do something-because one of the Doom Patrol's oldest enemies is on the comeback trail, with an entire new Brotherhood of Nada in tow. The secrets of Lotion the Cat and Terry None are also about to be revealed, and an insidious plot to turn the Doom Patrol into something normal is in play. Will Cliff, Casey and company be able to stop the madness-before the madness stops? Find out in Doom Patrol Vol. 2: Nada-a multidimensional milestone in the celebrated saga of the World's Strangest Heroes, made fresh for you by the Eisner Award-winning creator of The Umbrella Academy and My Chemical Romance co-founder Gerard Way and acclaimed artists Nick Derington, Tom Fowler, Michael Allred and Dan McDaid!